Home/guides/For or against ? Name tags with permanent or temporary names. You want to identify your employees, but for time, money and staff turnover saving matters, you want name tags you can easily and quickly modify ? Our vision of the matter is very logical. 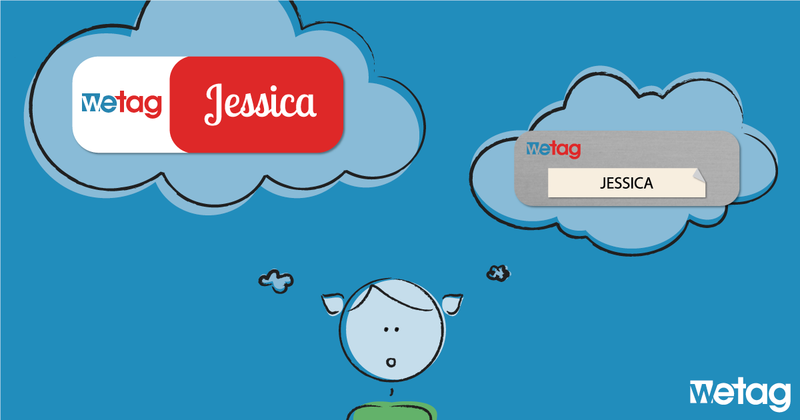 When the Wetag team addressed the issue, we discovered a new side of this strategy and we found many solutions for you. No matter your field of activity, it is important that your company keeps a clean image. The name badge is also a part of your marketing strategy because many clients see it. If you use « P-Touch » stickers and they come off a little, it doesn’t project a very professional impression. In case you prefer to write by hand, you may feel it adds a more personal touch, but your writing should be easy to read. For these 2 issues, we encourage the use of a permanent name tag for your employees. However, we still haven’t answered your time and money saving arguments. Time saving : Find a good supplier for permanent name tags. The order of new name tags will require 1 to 2 minutes and you won’t need to fix broken adhesives. Money saving : It is true that a couple hundred blank name badges are cheaper than personalized ones. However, a permanent, carefully designed permanent name tag will give you a great image and your employees will be proud to wear it. Impact on the staff : We know that staff turnover costs around 35% of an employee’s salary (source). A permanent name tag can become a part of your retention strategy, because this investment is made in the person, and they will be grateful to be an employee that really matters to the company. Of course, a name tag isn’t a solution in itself, but if this contributes to extend their employment for even a month, it may represent an economy of up to 160$ for an employee that only works 10 hours a week (10.55$/ hr X 10 hours a week X 52 weeks X 35% / 12) and more than 640$ for an employee who works 40 hours a week. The name tag then becomes an investment instead of an expense. Dedication at work : A temporary name tag tells your employee they may be replaced quickly, which doesn’t motivate anyone, not even you. An employee that feels important at work will be more dedicated. The permanent name tag contributes to their motivation and integration and to help them find their place in the company. Impact on the image : As already stated, a label that doesn’t stick isn’t very stylish. Even if the labels are properly stuck, you can still see them, and their technical limits considerably affect the aesthetic aspect. When we design a name tag, we take the best in each of our processes to make it distinctive while staying within budget. Your clients will notice this little detail that will set you apart. Now, the solution : Find a supplier that allows you to buy only one name tag at a good price and that ships quickly. If you don’t have time to wait for the delivery, use your good old technique until you receive the real name badge. How do you manage your name tags ? Do you have a different vision ? We would like to know it. Are you an expert in brand image or human relations? We would love to know your vision. high-qᥙality writing like уours these days.